Pulled pork is not an easy thing to make. Cook the shoulder too long and it dries out, too short and it won't pull properly to create those textbook long tender slithers of meat. With pork cheeks you admittedly don't get those long slithers, and it can't really be 'pulled' in the same way, but the same end goal is still achieved - beautifully tender, flavoursome pork that's goes perfectly with a sweet, smokey BBQ sauce. Plus they can be braised for anything between 2 and 6 hours (on different heats) and will come out just fine. Which is why they're perfect for making my version of pulled pork - they take all the risk out of the process. As a side note, if you've never cooked with pig's cheeks then forget what you think they'll be like. The cheek is not the same thing as the jowl, aka the fleshy, fatty side of a pigs face used to make guanciale. The 'cheek' in most butchers refers to the cheek muscle itself, which once trimmed by the butcher is a small, rotund, fat marbled piece of meat about 4 inches long. 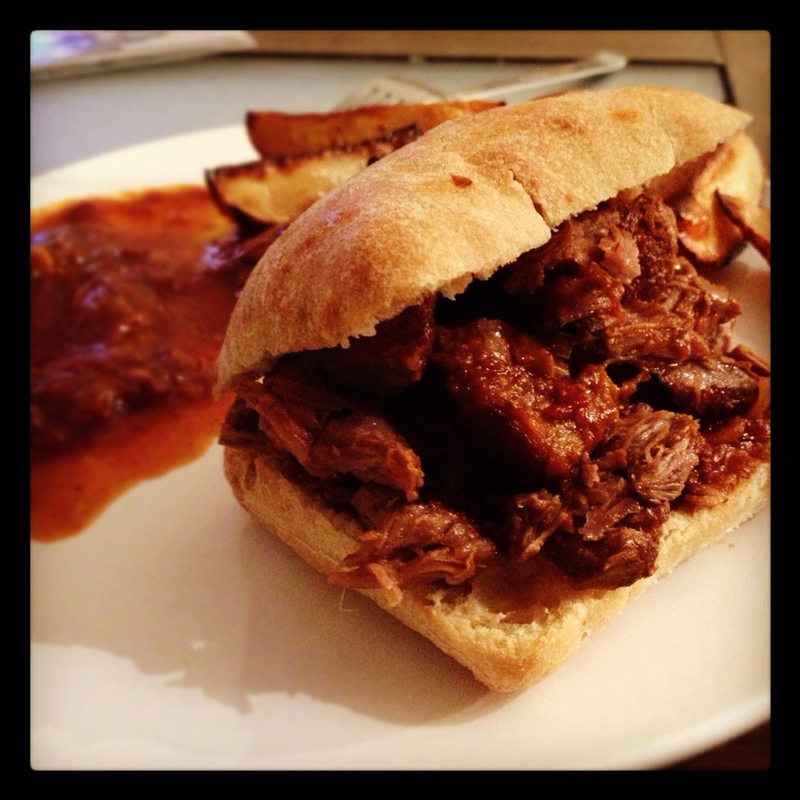 To make my pig's cheek 'pulled' pork I'll be calling upon the same smokey BBQ sauce I used with brisket previously. It's my go to barbecue sauce recipe because it satisfies the taste buds on so many levels, with brown sugar, smoked chipotle peppers, rich tomato and cider vinegar all coming together to create a sum much greater than its parts. It's dead easy to make. Firstly brown whatever meat you're using in a large oven proof dish (my trusty cast iron pot comes in handy once again), remove the meat then soften one large onion and five crushed garlic cloves. Next simply add all of the other ingredients (ingredients list at the bottom) including your meat, bring to the boil then cover and transfer to the oven to cook low and slow. I went for 4 hours at 160*C, but if you're in a rush 2 hours at 180-190*C will work fine too. Once tender remove the meat to a plate to rest. At this point you can add more sugar or seasoning to suit your tastes and either use a hand blender to create a smooth, silky BBQ sauce, or leave it a bit more chunky. To serve simply squash the pork cheeks with a fork until broken up into a rough chop, then whack into a sour dough or ciabatta bun and spoon over loads of the sweet, smokey, spicy sauce. To go with BBQ food you want something a little bit smokey, so a porter will always work well, particularly as this dish has a spicy tomato base which always seems to work well with roast malt. 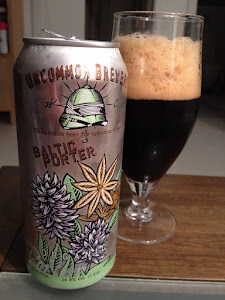 I went for an Uncommon Brewery Baltic Porter, its brewed with star anise and licourice root which gives the finished beer a savoury note which is closer to caramelised meat or even marmite than chewy sweets, and which worked great with the spicing in the food. Whilst it does have some brown sugar flavours (again a nice match with the food) and a little sweetness to it the hopping is aggressive too, which very much helps to keep things in check and means that overall it is a wonderfully well balanced brew. All in all, a brilliant beer match with this cracker of a pork sandwich. Very tasty recipe well explained and illustrated. Thanks for sharing. Hey man, good work for putting a Porter in there. I hate seeing BBQ recipes and people just whack a Pale Ale or Lager in there because it's vaguely BBQ. Ambers, Stouts and Porters are definately the way to go; spot on! this sounds lovely! Going to try this for sure. I was wondering what quantity of pigs cheek this amount of sauce would cover? I have 10, around 1kg of meat. That sauce should easily cover 10 cheeks. If in doubt add a touch extra water while cooking, then remove the cheeks once cooked and reduce the sauce to desired consistency.